After years of waiting and frustrating delays, SEPTA riders are finally getting a modern card payment system. Not only will we be able to use credit cards to pay for transit rides, and automatically refill our passes online, the payment system will introduce the city to a brand new technology--a technology that could combine with policy changes to drastically increase transit ridership, and meaningfully change the way Philadelphia residents and visitors get around our city. The shift away from tokens is a momentous change, but it's small potatoes compared to some of the economic changes that the cards will make possible. As one SEPTA employee put it to me, "we're essentially building a bank." The transportation-related aspects of SEPTA Key have been covered the most in the media, but one of the more under-appreciated changes of SEPTA Key is that it will eventually allow people to deposit a paycheck directly onto the card, and use it like a pre-paid debit card. Most people, of course, won't choose to deposit their whole paychecks onto their SEPTA Key cards, but this is going to be a big deal for many SEPTA riders who live in low-income communities, some of whom aren't in the traditional banking system and rely instead on expensive check-cashing services. In Chicago, the pre-paid debit card feature was the subject of some controversy because many felt the card fees were too high, so that's something to watch, but generally speaking, this feature is going to have a small but significant positive economic impact on many people's lives. There's no such thing as a free lunch, except there is, and it's negotiated group rates for transit passes. Across the state in Pittsburgh, the Port Authority enters into contracts with local universities where transit passes are provided automatically to all students and faculty at local colleges and universities at a deep discount. The passes are automatically bundled into tuition as a transportation fee of around $200 a year. All full-time employees, from professors, to administration staff, to custodians receive transit passes with their benefits. When they swipe their chip cards to get on the bus, the PAT invoices the university for the trip at a 50% discount. Everybody wins: SEPTA gets a large tranche of guaranteed revenue (that ideally they would use to improve service); students get a cheap mobility option that greatly expands their access to the city and region; and local universities get a highly effective marketing tool for attracting students. The "free" transit pass is apparently a favorite talking point for university tour guides marketing to prospective students, and this also takes some pressure off them to build or replace expensive parking facilities in the future. Several other cities including Chicago and Miami have similar policies, and SEPTA is now actively exploring the idea thanks to the confluence of a highly successful advocacy campaign from the SEPTA Youth Advisory Committee, and an eyebrow-raising bus ridership dip last year that they're hoping to reverse. Getting unlimited transit passes into the hands of every single student and employee of our local higher education institutions would mean a major ridership bump for SEPTA. In 2014, all higher-ed institutions in the City of Philadelphia enrolled about 155,000 students. It would also mean a substantial revenue bump. For those worrying about transportation funding cutbacks at the federal and state level, this is by far the easiest and least controversial way to starting to build a stronger and more predictable local revenue stream for transit. The bulk fare contract policy was in place in Pittsburgh prior to the adoption of smart cards there, but the addition of smart cards makes the policy infinitely more scalable. Our large higher-ed institutions are a great place for SEPTA to begin banking ridership and revenue streams through bulk fare contracts, but the sky's the limit for these kinds of deals. Large employers like Comcast or Independence Blue Cross, City employees, airport workers, large residential towers--any sufficiently large group is a potential bulk purchaser of transit passes. Could we create a density bonus in the zoning code for supplying tenants with SEPTA Key cards for some period of time? The possibilities are truly endless. As Human Transit author Jarrett Walker explained at his Penn lecture the other night, planning a fast and frequent bus network is all about creating straight routes, on a grid, with free and easy transfers between those routes. The whole thing is built around transfers. Nobody really likes to transfer, but to oversimplify a bit, in many cases you can just run a lot more buses more frequently if you make people transfer more. If increasing the frequency and reliability of our bus network means encouraging more transfers, then just about the dumbest thing we could do is charge people money for the inconvenience of transferring from bus to bus, or from bus to subway. Walker has called paid transfers an "insane" policy, and a Delaware Valley Regional Planning Commission analysis of various transfer reforms estimated that SEPTA could see a ridership increase as high as 11% over the long-term if they opted to end the paid transfers policy. SEPTA brings in about $12 million from paid transfers, which isn't a huge amount of money, but also isn't nothing, so there's a need to identify a pay-for. Ideally, a portion of the proceeds from new bulk fare purchases would be used to pay for free transfers, but there's no guarantee the SEPTA Board would use the revenue for this. There's also a messaging problem for free transfers, where this sounds like a great idea to SEPTA users, but a terrible idea to conservatives in Harrisburg. Philadelphia bus riders getting something for free? The best way around this semantic trap is to move toward a time-based payment, where one transit swipe is good for one hour, or whatever amount of time people feel is fair. Inside that hour, you can re-swipe as many times as you want and not pay a penalty, and this would work for the majority of bus trips. The other obstacle, which is partly about money and partly not, is that SEPTA is unsure of how free transfers would reshape bus ridership patterns. Free transfers between buses and subways would probably increase the appeal of crosstown trips, with more people wanting to take a crosstown bus to their nearest Broad Street Line stop, and taking the BSL the rest of the way downtown. Currently, people will take these long bus trips all the way from North Philly and Northwest Philly to Center City, seemingly just to avoid transferring. For Exhibit A of how paid transfers encourage people to use the transit system inefficiently, check out this map the city made showing the most popular SEPTA routes by ridership. Some of the most popular bus routes are ones that run, more slowly, directly parallel to the Broad Street Line. This is a costly and inefficient pattern for SEPTA, since there's a ton of unused capacity on the Broad Street Line, but very little unused capacity on city streets. It would be better to encourage people to take a crosstown bus trip and transfer to the Broad Street line, but people avoid doing this, and it doesn't help that there's an extra charge for it. Currently SEPTA's crosstown bus service is pretty anemic and infrequent, as you can see on Thomson Kao's frequent service bus map. Only six crosstown lines have on-peak headways of 12 minutes or less, which is really the upper limit of what can be considered frequent service, and it only gets worse off-peak. 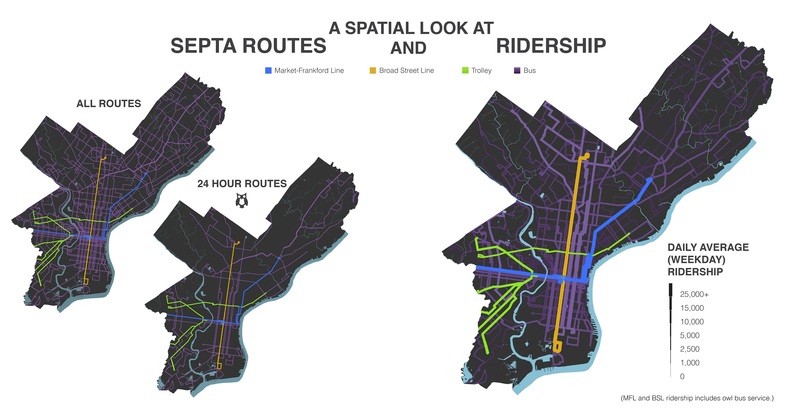 If free transfers shifted ridership toward these crosstown routes, SEPTA might have to shuffle some buses around, and it could end up costing them more than the $12 million that transfers bring in. That isn't a good reason not to do this, but it's one of a few unconvincing reasons why SEPTA officials are hesitant to prioritize eliminating paid transfers. However, the introduction of SEPTA Key, and the phase-out of both tokens and paper transfers, makes the case for retaining this counterproductive relic of the 19th century fare system less convincing than ever. This is an excellent summary of some of the ways the Key system can help make more than SEPTA’s fare payment system better. University pass programs (aka deep discount group pass) have been successful across the country. It’s good for students, faculty, and staff, and the savings (in reduced parking demand and traffic) have been well documented. Looking beyond universities to other large employers makes good sense. Regarding the possibility of phasing in “free” transfers, the benefits to riders would be significant, and likely the equity impacts would be substantial.